Tony George of the Indy Racing League. Tony George will no longer have day-to-day responsibility for running his family businesses, including the Indianapolis Motor Speedway. Current Chief Financial Officer Jeffrey Belskus is the new CEO of the Indianapolis Motor Speedway Corp., and current chief legal counsel W. Curtis Brighton is the new president and CEO of Hulman & Co. The changes took effect Wednesday. George remains on the board of directors of the Hulman-George companies, along with his mother and three sisters. But he will focus on running his IndyCar Series team, Vision Racing. The changes come one month after the family denied reports that George had been ousted from his executive positions during the annual meeting. But the family issued a statement that said George had been asked to "devise a plan for management of Hulman & Co., the Indy Racing League, Clabber Girl and the Indianapolis Motor Speedway that would allow him to focus on the business which requires the greatest attention." It is not immediately clear how much involvement George will have in running the Indy Racing League. The Board of Directors of Hulman & Company and the Indianapolis Motor Speedway announced June 30 that a new management team comprised of veteran IMS executives W. Curtis Brighton and Jeffrey G. Belskus will head the Hulman-George companies effective July 1. "Our board had asked Tony to structure our executive staff to create efficiencies in our business structure and to concentrate his leadership efforts in the Indy Racing League," said Mari Hulman George, IMS chairman of the board. "He has decided that with the recent unification of open-wheel racing and the experienced management team IMS has cultivated over the years, now would be the time for him to concentrate on his team ownership of Vision Racing with his family and other personal business interests he and his family share. "Tony will remain on the Board of Directors of all of our companies, and he will continue to work with the entire board to advance the interests of all of companies. "Our family and the entire racing community are grateful to Tony for the leadership and direction he has provided since 1990. We are pleased that he will continue to be an important part of the Indy Racing League as a team owner and as a member of our Board of Directors, and we wish him every success." Mrs. George underscored the confidence in the leadership of Belskus and Brighton, who both were originally hired by Tony George. "Jeff and Curt have both been with the company for many years in positions of top leadership," Mrs. George said. "Tony, as well as the entire Board of Directors, has the utmost confidence in their capabilities. "Both of these men have years of experience and leadership within our companies. In addition, each of our companies has effective presidential leadership, and that will remain in place." Joie Chitwood is president and chief operating officer (COO) of the Indianapolis Motor Speedway, LLC. 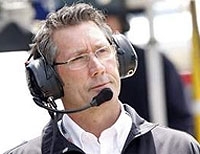 Terry Angstadt is president of the commercial division of the Indy Racing League. Brian Barnhart is president of the competition division of the Indy Racing League. Charlie Morgan is president and COO of IMS Productions. Gary Morris is president and COO of Clabber Girl. "These changes underscore our family's commitment going forward to all of our companies, especially our commitment to the growth of the Indy Racing League and the sport of open-wheel racing," Mrs. George said. "We believe the Hulman-George family's long stewardship of the Indianapolis Motor Speedway, beginning in 1945, and our significant investment in the Speedway and in the IRL demonstrates that we have full confidence in all of our companies and that we intend to grow them in the future." In his role with the Indianapolis Motor Speedway, Jeff Belskus has had primary leadership responsibility for the financial operation of Hulman & Company in Terre Haute and its subsidiaries, including IMS and the Indy Racing League. Terre Haute native Belskus joined the company in 1987 and was elevated to treasurer in 1989. Already functioning as the company's chief financial officer, he was promoted to vice president in 1991 and named the company's executive vice president in January 1994. Belskus graduated with honors in 1981 from Indiana State University, where he received his bachelor's degree in accounting, and earned his CPA designation in the state of Indiana in 1985. His professional affiliations include the treasurer of the Rose-Hulman's Board of Trustees, American Institute of CPAs and the Indiana CPA Society, and the Indianapolis chapter of the Financial Executives International. Additionally, he serves on the Indiana State University Foundation board, where he is a member of the audit committee. He also serves on the board of directors of the Morris Plan Company of Terre Haute and the Indiana board of The Nature Conservancy. Belskus and his wife, Debbie, reside in Zionsville, Ind. Curt Brighton joined Hulman & Company in January 1994 as vice president and general counsel. Brighton was promoted in October 2002 to executive vice president and general counsel of Hulman & Company, and serves in a similar capacity for the Indianapolis Motor Speedway, Clabber Girl Corporation and Indy Racing League, the principal operating businesses in the Hulman family of companies. Prior to joining Hulman & Company, Brighton practiced law in Terre Haute, Ind. In addition to his duties at Hulman & Company, Brighton is a board member of several business and civic organizations, including First Financial Corporation, First Financial Bank, Indiana State University Foundation, Princeton Mining Company, Templeton Coal Company, Union Hospital and United States Auto Club. His professional affiliations include the Indiana State Bar Association and the Iowa State Bar Association. Brighton's responsibilities have included coordinating the legal, risk management, human resource, real estate and philanthropic activities for all Hulman-affiliated businesses. He is a 1976 graduate of Indiana State University and a 1981 graduate of Drake University Law School. Brighton and his wife, Linda, reside in Terre Haute.